In this tutorial, you will learn how to create a game where the player is being chased and has to keep running for as long a possible without getting caught by the flying emoji. The smiley emoji has to avoid being caught by the ghost emoji. You can customise this game as much as you like with your own characters. Go to woofjs.com, login and create a new project. The first thing we will do is change the backdrop colour. You can either provide the name of the desired colour eg. setBackdropColor(“green”) or if you want to use a specific colour you can use a colour code (colour codes begin with a # and contain a combination of 6 numbers and letters from a to f). You can find colour codes at www.codemahal.com/colourpicker. You can also use an image for your backdrop if you like (refer to the previous two tutorials). Tip: All of this code can be squashed into one line but to make it easier to read here, each property for the player variable has been added on a new line. Next, we can add the “Game over” message text and “Press P to play again” text which will display on screen at the end of the game. Once you have added the two text objects, set them to be hidden using the gameOverText.hide() and playAgainText.hide() lines. text: "Press P to play again"
Now you should be able to move the player object (smiley emoji) around the screen using the arrow keys on the keyboard. Now that we are able to move the player around, we can add enemies (in the form of ghost emojis) that will spawn in random locations at each edge of the screen pointing towards the player. Firstly, we create an empty array (an array is like a list) called enemies which will be used to store all of the enemy clones that will spawn during the game. We will use the same enemy sprite (a ghost emoji) for each individual enemy but every half a second, clone the enemy sprite and then use random number variable to determine which position the enemy clone should start from at different edges of the screen. Once the enemy clone spawns at a random location at the edge of the screen it will be pointed towards the player and added to the enemies array. Now we can add a forever loop which will go through each enemy that exists in the enemies array and check if they are touching the player. If an enemy touches the player, then the “Game over” and “Press P to play again” text will be displayed on screen. The player object will also be hidden and the freeze() function will be called which will freeze the screen. This is what the game and code will look like once you’re done! Now play your game and see how long you can last without getting caught by a ghost emoji! You can try adding a high score feature to the game and also adjust some of the variables to increase or decrease the speed of the enemy movements depending on how challenging you want the game to be. You could have the enemies start off moving slowly and gradually build up speed over time too. Make sure you save your work! Add a background (backdrop) for the game. You can make your own backdrop or use one provided at codemahal.com/sprites such as the sky background used below. The line of code above basically can be interpreted as: When the game begins create a variable in the game called highScore, and set it to store the high score value that was saved last time this game was played by the user (using the name “userhighscore”), or if no high score exists then set the high score to 0. Next, we create a variable to store the score for the current game which will be set to 0 at the beginning of the game, and we create the text to display the current score on screen (under the score heading text). You’ll notice once the apple falls past the bottom of the screen it will keep falling! We will add some code shortly which will make the apple respawn at the top of the screen again. Inside the forever loop we just added, we can add code which will check if the apple is touching the player (rectangle) and if so, we will move the apple back to the top of the screen (on y axis) and in a random position across the screen (on x axis) so it can fall again. We will also increase the current score by 1, update the score text on screen to reflect the current score, check if the current score is higher than the high score and if so, update the high score. Make sure you close all brackets for the forever loop and if statements. Now we need to add code which will end the game if the apple falls and the player doesn’t catch it (in other words, if the apple falls below the bottom edge of the screen). This will display the “Game over” message on screen and ask the player to press P to play again. We created this text earlier but it is hidden while the game is running. By adding the code below, the “Game over” and “Press P to play again” text will show at the end of the game. Add the following code inside the forever loop we used in the previous steps. This code will check if the apple has fallen below the bottom edge of the screen, and if it has then the “Game over” and “Press P to play again” text will be displayed on screen. Make sure you save your code! If you click on the icon at the top right corner of the screen then the game will open in full screen in a new tab. You can also share the link in that tab with your friends so they can play your game. The first game we will make is a 2D game where you have to move around and using the keyboard to catch as many monsters as you can in 20 seconds. Make sure you create your free account so you can save your games to your profile. Click on Login / Sign up and then provide your email address. On the next screen. 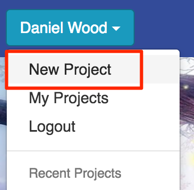 Once you have created your account and logged in, click on your account name in the top left corner and then click New Project. A new empty project will open. Click on Save in the top right corner. Make sure you save your work regularly while you are coding. Then give your project a name and click OK.
As you can see in the image above, there is already one line of code there. This line of code is used to specify the background for the game (or at least this part of the game – you might have many different levels and menus in your game, but let’s just start with one level). setBackdropURL is a function which takes a link (also known as URL, or Uniform Resource Locator) to an image (such as a GIF, PNG or JPG) and uses that image for the background or backdrop. Tip: You can create your own game sprites (backgrounds, characters and other objects) at piskellapp.com and use those sprites in your WoofJS game. You can also download free sprites to use in your project from codemahal.com/sprites. So now we have a nice grass backdrop for the game. The game can be played in full screen but at the moment we can just see a preview of it on the left side of the screen. Now that we have a backdrop, we can add our first character to the game which will be the player. We can use an image sprite for the player too so we will need to specify the image to use for the player before we can specify its width, height, position, etc. There are rules that you must follow in programming language such as ending a statement/line with a semi-colon, using certain brackets, and correctly spelling keywords used in a language, for example, var and if. These rules are known as the programming language syntax. Because the image link is stored in a variable, whenever we want to use the image we just have to refer to the variable by its name rather than having to type in the long link every single time. In the code above, we create a variable called player and use the image from the playerImage variable to represent the player character. We then specify the width and height of the player. 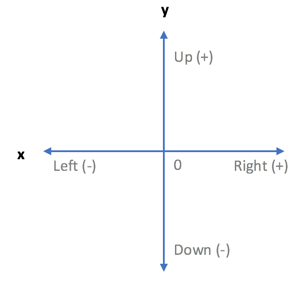 Lastly, we specify the x and y position of the player on the screen (x is horizontal axis across screen, y is vertical axis). Hint: x: 0, y: 0 is the centre of the screen. The next step is to make the player move! To do this, we need to check which keys on the keyboard are being pressed. We can use the up and down arrows on the keyboard to move the player up and down. We can also use the left and right keys on the keyboard to move the player left and right. Rather than just checking if a key has been pressed, we can check if keys are currently being pressed. We can use a forever loop to keep checking if keys are being pressed. We can also use includes to check if multiple keys are being pressed at the same time instead of just checking one key at a time. Create a forever loop and inside that forever loop you can add if statements that check if a key is being pressed and then move the player on the x or y axis in the direction according to the key that is being pressed. Your code and game should now look like this. If you click in the game preview window you can use the left, right, up, and down keys to move your character around! Tip: You can find different pieces of code to use for movement by clicking on Motion. You can use different pieces of code for control (eg. check if a condition is true, or repeat instructions) by clicking on Control. You can also find code for checking keypresses by clicking on Sensing. Now that we have a player and an enemy, we will need to allow them to interact. The aim of this game will be to catch as many enemies as possible in 20 seconds. When you catch an enemy another one will appear in a random location. A timer counts down from 20 seconds and the score is counted and displayed on screen. Before we allow the player to catch an enemy, we will add text on screen to display the score, countdown timer, ‘Game over’ message, and ‘Press P to play again’ message that displays at the end of the game. To add text on screen, you need to create a variable that will store the different text properties including the actual text displayed, font size, colour, font family, alignment, and x and positions on the screen. After adding this code, you should now see that the ‘Game over’ and ‘Press P to play again’ text. Next, we can add the countdown timer functionality. We can use the every function to specify that every 1 second during the game we want the time variable to go down by 1 (the time variable will start at 20 at the beginning of the game and go down by 1 until it reaches 0 and the game ends). Every second the timer will also be updated on screen. Now that we have a working countdown timer we can go ahead and add the ability to score points and make the enemy respawn in random locations on the screen. Every time the player touches the enemy, the score variable will increase by 1 and the score text will be updated on screen. The enemy will then be moved to a random x and y position on the screen. minX is the minimum x position on screen (left edge of screen) and maxX is the maximum x position on screen (right edge of screen). minY is the minimum y position on screen (bottom edge of screen) and maxY is the maximum y position on screen (top edge of screen). The enemy will respawn in random positions between those points. Note that in the code below we have the line enemy.y = random(minY, maxY – 30) which will place the enemy at a random y position on screen but 30 spaces below the top of the screen. This ensures that the enemy doesn’t respawn behind the score or time remaining text. After adding this code as shown below, you will be able to collect points every time you catch the enemy. You can also improve this code by making sure the enemy doesn’t respawn too close to the edge of the screen where it might be partially hidden. You could also randomly respawn the player for extra challenge. Once the time has reached 0 we won’t want the player to keep moving around and collecting more points (they will have to start a new game). So we can say that if(time === 0) (which means “if time is equal to 0”), set the player and enemy sprites to be hidden and show the ‘Game over’ text and ‘Press P to play again’ text on screen. Add the following code after the code you added in the previous step (inside the forever loop). 1. What do the following key terms mean? Can you give an example for each? 3. Two main types of errors you might encounter when coding are logic errors and syntax errors. Explain the difference between these two different types of errors. Look at all the different blocks for different pieces of code you can use – experiment with code and work out different ways of solving problems – it’s the best way to learn coding! You could try adding a feature to your game that allows it to save high scores. You could also add hazards to avoid, make the player respawn in random locations, or make the monster move around. Also, try improving the appearance of text on screen by changing font family/style.